Cast steel is used where high forces are needed and where ductile or malleable iron are not strong enough. Another reason for using cast steel is its weldability. We distinguish between unalloyed and alloyed cast steels. 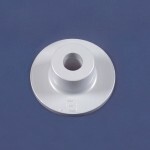 Unalloyed quality grades are GS-c25, GS 45, GS 52 and GS 60. Alloyed quality grades are GS 20Mn5 and GS 42CrMo4. To get an ideal structure, cast steel is always annealed after moulding. Gelegeerde kwaliteitsaanduidingen zijn bijv. GS-20Mn5, GS-42CrMo4. Cast steel is more viscous than cast iron and therefore the minimum wall thickness with sand castings is 7 – 8 mm. This makes the process less appropriate for small accurate parts. 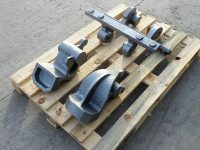 Examples of cast steel components are frame corner pieces for welding into, couplings and mounting parts. We supply automated castings from 0.5 kgs up to approximately 120 kgs unit weight.